There are some favourite dishes which simply taste the best when they come out of your mother’s kitchen, take for example Chicken Fricassee. Well, watch out, mother dear, you’ll have to be strong, because the kitchen at Alcazar is making Chicken Fricassee as well as you do. Loaded with capers, fresh asparagus, tender chicken and the added bonus of sugar peas and broccoli, this dish, which can be a pallid beige-green mess at other locations, looks especially appetising at the Alcazar. With its good-value home cooking, this place is an excellent choice for a proper lunch. Among the dishes you have to try are the Königsberg meatballs, the Herring and the Frankfurt Green Sauce. What’s more, the atmosphere is lively and congenial. 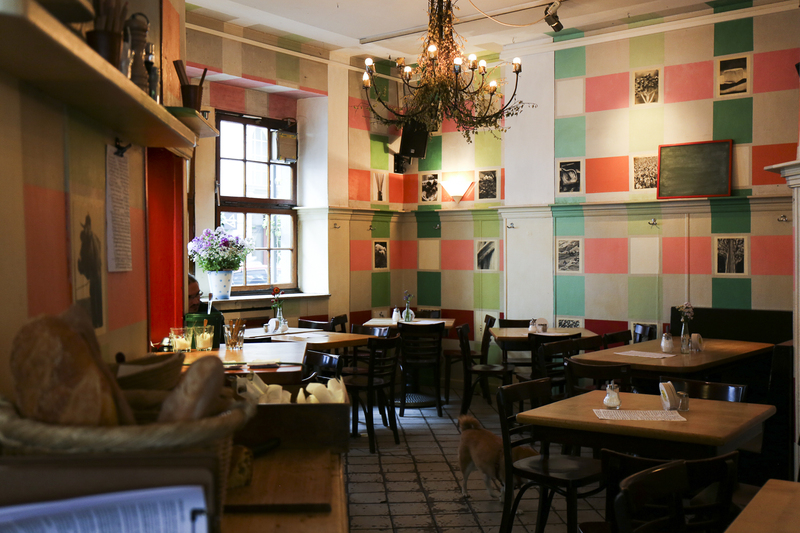 Most of the surrounding neighbourhood is taken up by the ample and comfortable Holzeckbänken Platz, ensuring good conversation at your table even when you don’t know anyone. It’s very sociable here, and after a few moments you’ll have a spontaneous sense of wellbeing. It is worth taking a look at the walls, where colour designer Henrike Müller has put together countless black and white photos along with pastel coloured squares, creating a hand painted, and utterly original wallpaper with an attractive Patina coating. Throughout the restaurant, market-fresh flowers sit on the table. The Alcazar in a phrase? Simply Beautiful.